During August and September 2014 the skies of the United Kingdom would be filled with the roar of eight Rolls-Royce Merlin engines when, for the first time in 58 years, two Avro Lancasters would display together. This is the story of those unforgettable 6 weeks when the Canadian Warplane Heritage Museum's Lancaster visited the UK and along with its counterpart of the Royal Air Force Battle of Britain Memorial Flight displayed at over 60 events nationwide. On the 24th February 2014 the Royal Air Force Battle of Britain Memorial Flight and the Canadian Warplane Heritage Museum announced a 'once in a Lanc time' event. The CWHM's Avro Lancaster would make the 3,700 mile trip to RAF Coningsby, the home of the RAF BBMF, to join up with their Lancaster to display at a number of events nationwide. Efforts had been made in the past to unite the two Lancasters however a window to do so had now appeared and the tour would be made even more unique by the fact it was the 90th anniversary of the Royal Canadian Air Force. Of the 7,377 Lancasters produced only two survive in airworthy condition and they would now fly together conducting a tour of the UK. They would appear at a host of venues and airshows to pay tribute to the 55,537 aircrew, 10,655 of whom were Canadian, who lost their lives during the Second World War whilst serving with Bomber Command. Rolling off the production line as a Mk X at Victory Aircraft, Martin during July 1945 the aircraft would later be converted to a 10MR, for use by the Royal Canadian Air Force as a rescue aircraft. However the plane would be involved in a serious accident which would necessitate the wing centre section to be replaced. This would be found on a Lancaster that had seen action over Germany. Going on to serve with No. 405 Squadron, Greenwood, NS as a maritime patrol aircraft and would also serve with No. 107 Rescue Unit, Torbay, Newfoundland. Staying in service with the RCAF for 18 years before retirement in the latter part of 1963. Ending up on display outside the Royal Canadian Legion in Goderich, Ontario 1977 would see the aircraft begin the road back to flight, when, with the help of the Sulley Foundation funds were found to acquire the Lancaster. 11 years and a full restoration later on the 24th September 1988 the aircraft took to the skies once again. It was decided to paint the Lancaster in the scheme of KB726 VR-A in memory of Victoria Cross recipient Pilot Officer Andrew Mynarski, as this was the scheme his aircraft flew in with No. 419 (Moose) Squadron. This sees the aircraft known as the 'Mynarski Memorial Lancaster' with another nickname being 'VeRA'. PA474 was built as a Mk I by Vickers Armstrong's Broughton factory at Hawarden Airfield, Chester on the 31st May 1945, by that time the war in Europe was over the aircraft was intended to be used in the 'Tiger Force' as part of the air campaign against Japan and was being prepared accordingly. However the war against Japan ended before the aircraft could take part so the Lancaster would go into storage. A new lease of life would be given to the aircraft when it came out of storage to be used for photo reconnaissance duties. This would see PA474 undergo various modifications, including the removal of all gun turrets and a bare metal finish. Then sent to No. 82 Squadron in East and South Africa to perform aerial survey duties for just under 3 and a half years, from September 1948 till February 1952. On arrival back in the United Kingdom Flight Refuelling Ltd at Tarrant Rushton would be loaned the aircraft so it could serve as a pilotless drone. However the Air Ministry decided to use the Avro Lincoln instead. The next destination for the Lancaster was Cranfield and the Royal College of Aeronautics where it would spend the next 10 years (1954 - 1964) being used as a trial platform for testing experimental aerofoil sections. With a proposed Royal Air Force Museum in Hendon PA474 was considered as a static exhibit for the museum and was adopted by the Air Historical Branch for this purpose. As a result of these plans the aircraft was despatched to Wroughton where she would be painted in a blank camouflage scheme then off to RAF Henlow ready to be put on display. A final twist in the story of PA474 occurred the following year, 1965, when the commanding officer of No. 44 Squadron based at RAF Waddington, Wing Commander D'Arcy asked if the squadron could take care of the aircraft. Two years later after being restored Lancaster Mk I (PA474) took to the skies again whilst undergoing further work. November 1973 would see the aircraft join its current home of the Battle of Britain Memorial Flight and 1975 would see two more landmarks for the aircraft with an mid-upper turret from Argentina fitted and the City of Lincoln would adopt the plane with permission for the City's coat of arms to appear on the aircraft. These will always feature on the aircraft irrespective of the camouflage scheme being worn. The Canadian Lancasters journey would see her depart Hamilton, Ontario on Monday 4th August making two stops along the way at Goose Bay, Newfoundland and Keflavik, Iceland with a potential layover at Narsarsuaq, Greenland. With the 3,700 mile journey due to be completed on Thursday 7th August at RAF Coningsby, Lincolnshire with an extra 24 hours added to the schedule for unforeseen circumstances. After nearly six months of waiting since the announcement was made it was the 4th August at last and 'VeRA' was to begin its journey to link up with the RAF BBMF's Lancaster. As the departure time of 10:00am loomed a short ceremony was conducted before the eight crew members set about getting the plane airborne, three of whom were pilots to share the flying duties. One member of the crew paid £43,000 for the privilege of joining the flight. This was Matthew Munson who won the action for a place on the journey on eBay, with the money being used to help pay for the cost of the UK tour. Unfortunately a problem with a magneto in the number two engine lead to take-off being delayed by 24 hours. The crew would work late into the night, when finally at 1:05 in the morning 'VeRA' roared back into life and on the 5th August, just after 10:15am, the aircraft was on its way to Goose Bay, Newfoundland. The Lancaster would be joined by another of the CWHM aircraft its North American B-25 Mitchell for a short part of the journey. Then the B-25 left and the Lancaster was on its own en-route to Goose Bay where it arrived six hours later. The first leg was complete. 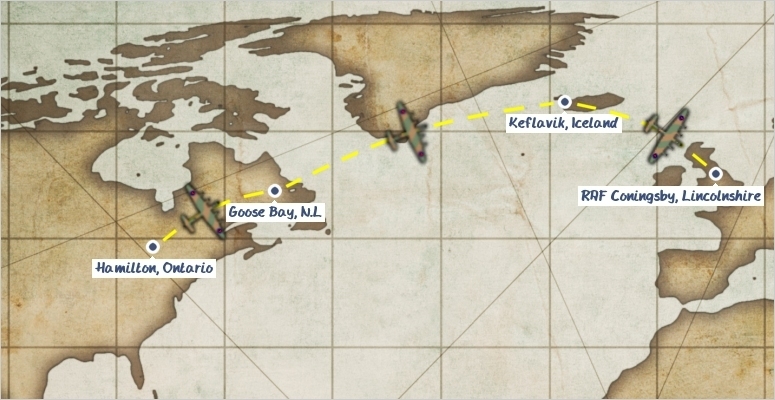 The second leg of the journey would be the most challenging one for the crew as the route from Goose Bay, N.L. to Keflavik, Iceland would see them fly over the Atlantic Ocean. 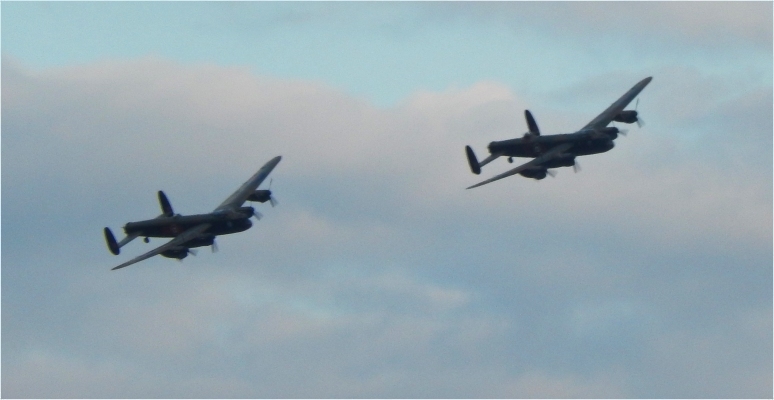 After a flight of around seven and a half hours the Lancaster touched down safely at its destination on the 6th August. The following day the crew took a well-earned rest from the long haul flying they had done as they made the short trip to Reykjavik, Iceland where 'VeRA' appeared on static display, before returning back to Keflavik for the final leg of their momentous journey. Friday 8th August would see the third and final leg of the Lancaster's journey as 'VeRA' took off from Keflavik to meet up with its counterpart at RAF Coningsby. Making its way to Lincoln it was intended for the RAF BBMF's Lancaster, Supermarine Spitfire and Hawker Hurricane along with the Red Arrows to fly in formation with the visiting Lancaster, however bad weather put paid to this happening. Despite the bad weather, after around twenty hours flying, 'VeRA' finally touched down at RAF Coningsby at 14:06, where hundreds of people were waiting to greet the aircraft and crew, then out of the cockpit window the Union Jack and Canadian Flag were unfurled. This was followed by a ceremony which included twenty Bomber Command veterans being presented with their Bomber Command Medal Clasps. After the long journey a short period of maintenance was required so the CWHM Lancaster would not make its first flight in the UK until Tuesday 12th August, four days after arriving, this would see the aircraft practising both on its own and with the Royal Air Force Battle of Britain Memorial Flight and its Lancaster, Spitfires and Hurricanes. This was followed on the Wednesday and Thursday with a number of displays with the RAF BBMF which were required so that the formation could be given its Public Display Authority to perform together, which was duly signed off on the Thursday. 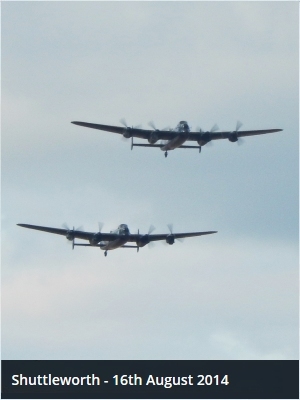 The two Avro Lancasters could now perform together and the much anticipated tour could begin. No sooner had the duo been given their PDA when they made their first appearance the very same day at Eastbourne International Airshow, where they would also appear the following two days. 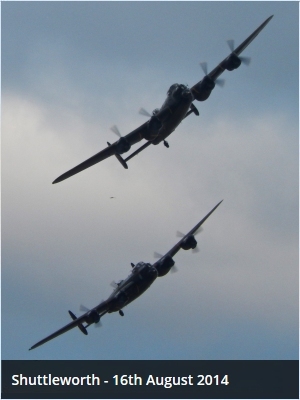 One of the early tour highlights occurred on Saturday 16th August when the pair displayed at the Shuttleworth Flying Proms whilst the National Symphony Orchestra played the Dambusters March. On top of all the planned flypasts and displays there were a number of special events planned as well. The first of these special events occurred on the 21st August and was dubbed the Avro 'Three Sisters' event. This saw RAF Waddington play host to the two Lancasters and the world's only flying Avro Vulcan (XH558) which had arrived the day before. The day began with the 2 Lancs landing at RAF Waddington and forming up with the Vulcan for a truly memorable sight. Then came the moment everyone had been waiting for as first 'VeRA' and 'Thumper' took off followed by XH558 as the three flew in formation over a number of venues. 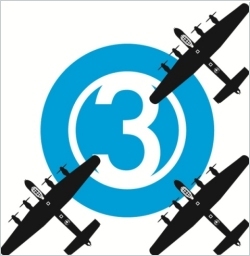 The first venue for the trio was Canwick Hill where the turf cutting ceremony for the Bomber Command Memorial in Lincolnshire was taking place then they made their way to Metheringham Airfield where they would fly directly over the memorial site. The penultimate venue was RAF Coningsby, home of the RAF BBMF and the CWHM Lancasters temporary home, before they arrived at their final destination of RAF Marham. The second major event of the 2 Lancs tour, and if 'VeRA' could only attend one location during its time in the UK it would be this one, would see the CWHM Lancaster visit what is now Durham Tees Valley Airport, formally RAF Middleton St George, on Thursday 28th August. It was here that Pilot Officer Andrew Mynarski took off from in his Lancaster when it was shot down over Cambrai, France on the 13th June 1944. Despite being unsuccessful in his efforts to help the rear gunner of the aircraft P.O. Pat Brophy, who would survive the crash of the aircraft, P.O. Mynarski was awarded the Victoria Cross posthumously for "valour of the highest order". Sadly despite bailing out of the aircraft he passed away shortly afterwards due to his injures. The day saw a service conducted around the statue of Pilot Officer Andrew Mynarski with the Lancaster itself landing at the airport to appear on static display. This was followed by a flypast from the Lancaster during the afternoon which saw the bomber fly over the Mynarski Memorial. In all around 4,000 people attended the day, including veterans, taking the opportunity to get up close and personal with this historic aircraft. The following day would see 'VeRA' suffer a major setback. Departing from Durham Tees Valley Airport for a local flight an unexpected engine problem reared its head when smoke appeared from the number 4 engine forcing the crew to shut it down. Thankfully the Lancaster landed back safely at Durham Tees Valley Airport. Although the damage wasn't as bad as it could have been it would be no quick fix. Unfortunately due to the engine problem a number of planned appearances had to be either re-arranged or cancelled. The main priority now was to get the Lancaster airborne as soon as possible and in this regard help was at hand. Thanks to both the RAF BBMF and Andrew Panton of the Lincolnshire Heritage Aviation Centre, where the Lancaster 'Just Jane' is based and taxys on a regular basis, there were two engines available for loan for the CWHM to use. It was decided to use the engine offered by the RAF BBMF to replace the damaged engine, but this wouldn't be a case of just swapping the engines over as the CWHM Lancaster used Packard 224s whilst the replacement engine was a Rolls-Royce Merlin 500 so some modifications were required. No time was lost on beginning the modifications required on the carburettor and a number of other fittings. Working alongside the CWHM and RAF BBMF would be Retro Track & Air (U.K.) Ltd, who are specialist in large piston aero engines, and between them they completed the job within 4 days. Thanks to a lot of hard work 'VeRA' was ready to fly again and returned to RAF Coningsby on the 3rd September. The 2 Lancs tour could resume. The next major events were to occur on the 2nd, although due to the engine problem delayed until the 14th, and 7th September. This would see three Lancaster at the Lincolnshire Heritage Aviation Centre as the CWHM and RAF BBMF pair performed a number of flypasts as the heritage centre's Lancaster 'Just Jane' taxied below. Both of these days saw sell out crowds of 5,000 witness this unique event. The final major special event, and the last event of the tour, would pay tribute to the Dambusters of No. 617 Squadron, which saw 19 Lancasters carry out low-level attacks on a number of dams in Germany in the early hours of 17th May 1943 in 'Operation Chastise'. To prepare for this mission the Derwent Dam in Derbyshire was used, as it was similar to the dams that would be targeted. 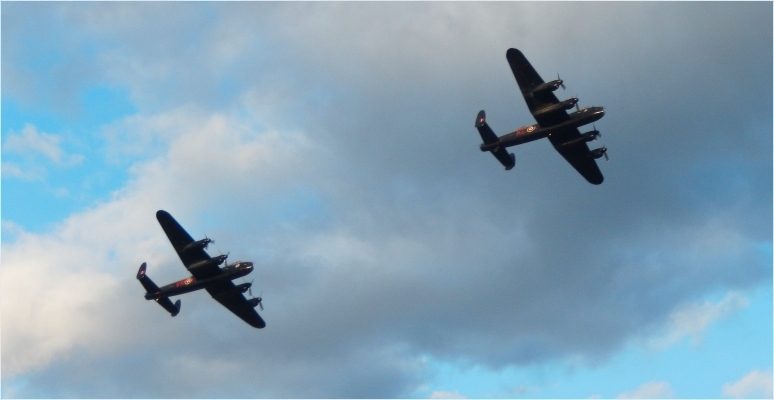 So on Sunday 21st September, with the assistance of Severn Trent Water, the two Lancasters flew over the dams three times with 'VeRA' playing host to a special guest. This was World War 2 veteran Sid Marshall who was a flight engineer on the Lancaster. With this event completed the 2 Lancs tour reached its conclusion. In total the Lancaster duo would appear at around 60 events, sometimes alongside other aircraft of the RAF BBMF, as hundreds of thousands of people flocked to see the pair display. This demand saw Duxford, Dunsfold and Little Gransden all sell out when the Lancasters performed, whilst other venues saw record attendances thanks to the duo. After six weeks of touring the UK the time had come for the Canadian Warplane Heritage Museum Lancaster to return home. Departing on the 23rd September from its temporary home at RAF Coningsby the beginning of the journey home would see 'VeRA' joined by 'Thumper' one final time along with a pair of Spitfires and a pair of Hurricanes, also of the Royal Air Force Battle of Britain Memorial Flight. The route taken would see the aircraft fly over RAF Cranwell, RAF Waddington, Lincoln Cathedral and RAF Scampton before the aircraft of the RAF BBMF turned home and 'VeRA' continued her journey home. Reaching the end of her journey home the penultimate leg would see the Avro Lancaster flyover the Canadian capital, Ottawa and for this she would be escorted by the North American P-51 Mustang and Curtiss P-40 Kittyhawk of Vintage Wings of Canada. Like 'VeRA' these two aircraft are also dedicated to Royal Canadian Air Force pilots with the P-51 Mustang in memory of fighter pilots Larry and Rocky Robillard and The P-40 Kittyhawk is in memory of Wing Commander 'Stocky' Edwards. Led by the CWHM Lancaster the formation completed two circuits around Ottawa before all three aircraft landed at the Vintage Wings hangar where hundreds of people had gathered. The memories, though, will last a lifetime.